Κωστής Τσαρπαλής > Διατροφή > It’s the food! Diet is the most important risk factor associated with the leading causes of death, above tobacco, blood pressure, obesity and anything else that you can think of. 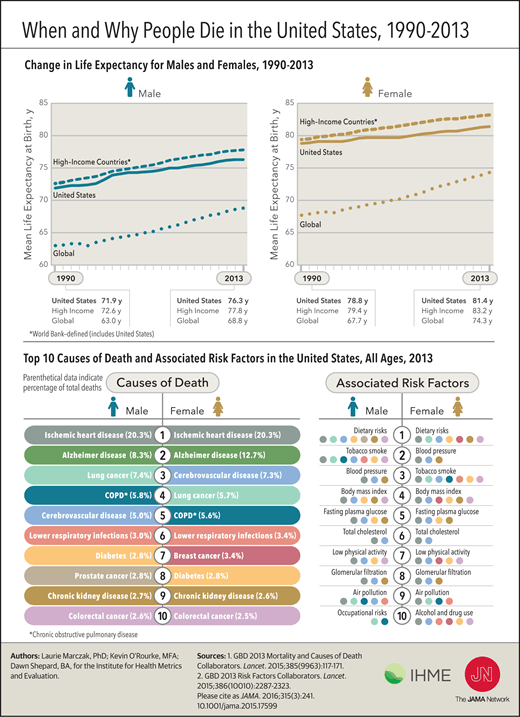 The fact that, of the five next important other risk factors (in the list of ten risk factors), diet causally correlates with four of them (namely blood pressure, body mass index, fasting plasma glucose, total cholesterol) only shows that even this estimate, if anything, is an underestimate of the true effect of diet. Dietary interventions should be the focus of any health related efforts, whether individually or socially. Everybody should feel partly responsible for such a change. Doctors at their clinic sessions, but also with the example they set as role models for their patients. Parents with their teaching but also with their cooking for their children. Schools with their educative programs but also with the food they offer to their students. And, last but not least, government and related institutions (both public and private, e.g. even big food business can be part of the solution potentially) with specific, direct policies for all citizens. And, of course, no such discussion can be complete without mentioning that, time and again, the diet that has been shown to promote health and longevity and prevent and fight disease most efficiently is a whole food plant based diet (and do spare the olive oil!). Get informed, get educated, make the change, and inspire others!